Lokomotiv Kuban Krasnodar stayed alive in the playoff race by holding off FC Bayern Munich 84-75 in the last Top 16 game for both teams on Thursday. Lokomotiv improved to 7-7 in the Group F standings, and will advance for the first time ever to the Turkish Airlines Euroleague Playoffs if Galatasaray loses at home to Partizan NIS on Friday. Bayern finished it debut Euroleague season with a 5-9 record. 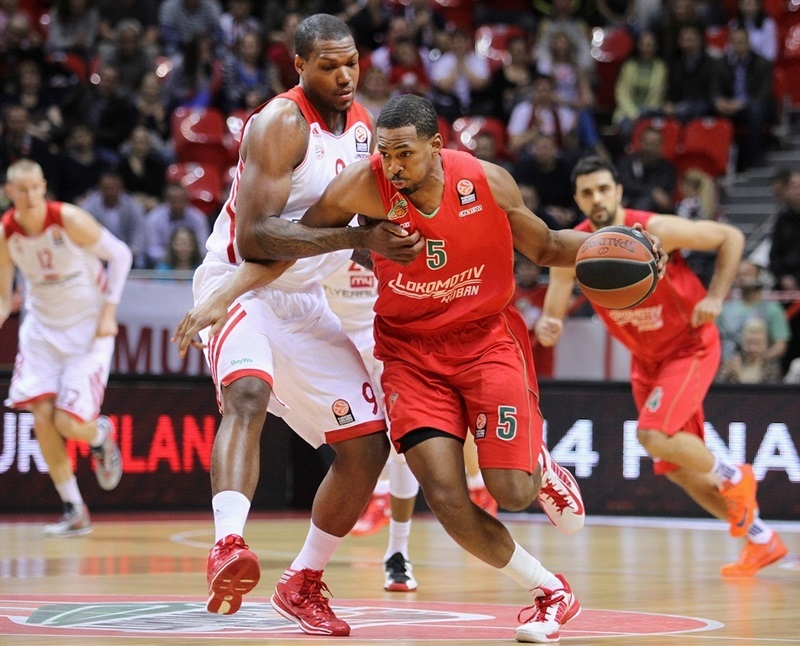 Lokomotiv took control early behind Krunoslav Simon and Derrick Brown, opening up a 42-25 lead. An 8-0 run at the start of the third gave it the biggest margin of the night, 54-35, before Lucca Staiger started hitting from downtown. 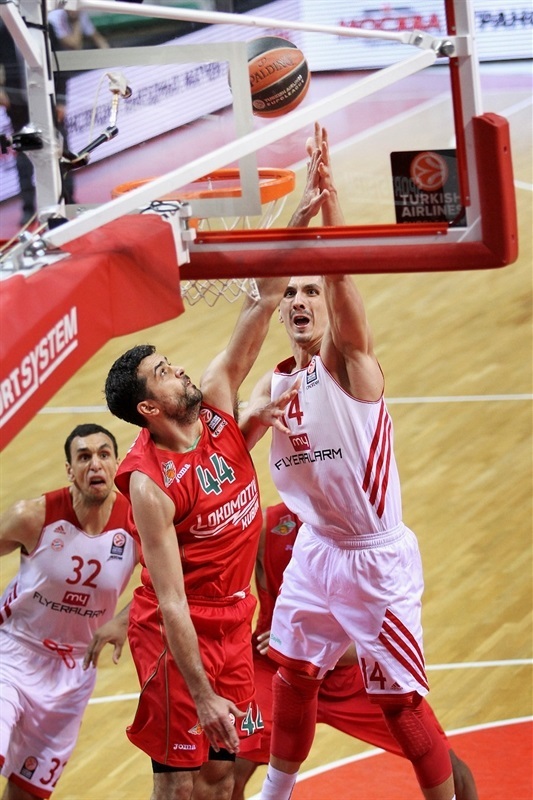 Bayern rallied, and Nihad Djedovic got hot in the fourth quarter as the visitors closed within 74-72. 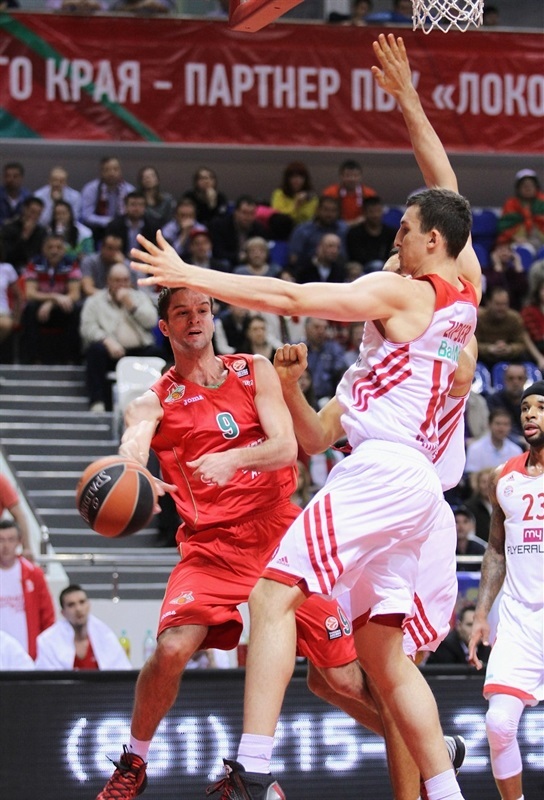 However, Lokomotiv held on by going 8 of 8 from the free throw line in the final two minutes. Brown and Simon scored 18 apiece in victory, while Richard Hendrix collected 11 points plus 8 rebounds, and Anton Ponkrashov also scored 11 for Lokomotiv. 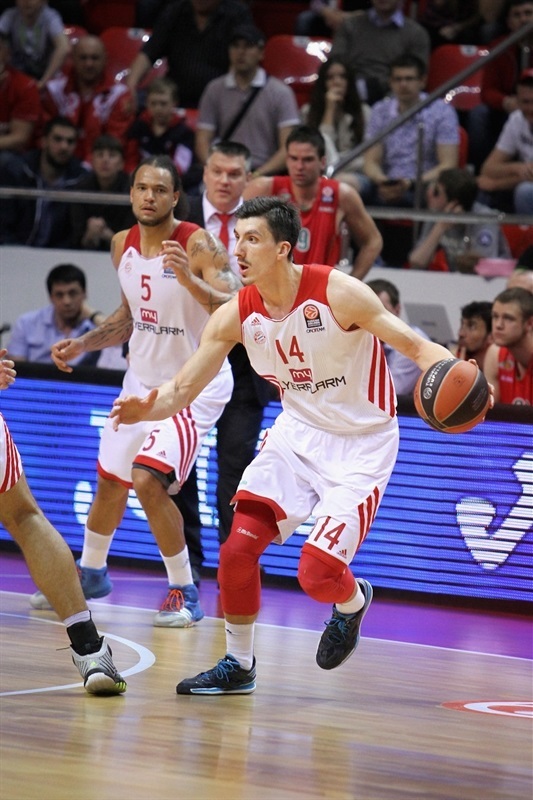 Djedovic finished with 16 points for Bayern, and Paul Zipser had a career-high 14 points. Staiger hit 4 second-half triples for 12 points, and Chevon Troutman also scored 12 while grabbing 7 rebounds in defeat. Djedovic made a steal raced on a breakaway to open the scoring, before Richard Hendrix opened Lokomotiv's account with a layup-plus-foul. Another Djedovic steal led to another easy fastbreak layup, before Simon sank a jumper to spark a 7-0 run capped with another jumper by the same player for a 10-4 lead. At the other end, Zipser hit a jump shot to cut the deficit, before trading triples with Simon. Troutman scored from close range for the visitors, but Anton Ponkrashov made a pair of layups for a 19-13 edge. Two free throws from Marcus Williams made it an 8-point affair in the final minute of the quarter, but Troutman nailed a corner triple for a 21-16 advantage. Andrey Zubkov started scoring in the second quarter with a three-pointer, and Mantas Kalnietis followed by driving the baseline for a tough layup and a 26-16 lead. Djedovic hit a shot for Bayern, but Simon nailed a three-pointer and Brown a long baseline jumper for a 31-19 advantage. John Bryant muscled his way inside for a hook-shoot, but Hendrix quickly answered with a layup before Brown's free throws extended it to 35-21. Yassin Idbihi made a put-back and a pair of free throws for Bayern, but Brown made another jumper and Simon a triple before those two players initiated a fast break for a 42-25 cushion. After a timeout, Malcolm Delaney hit a shot. Fastbreak baskets from Idbihi and Troutman were followed by a jumper from Delaney that capped a 0-8 run. Two free throws from Kalnietis got the margin back to double figures, and Brown drove the baseline to give Lokomotiv a 46-33 halftime lead. Zipser’s floater got things going in the third quarter, but Brown drove the baseline for a layup-plus-foul, and Valeriy Likhodey added a monster one-handed slam to make it 51-35. Simon made 3 of 4 free throws to extend the difference to 54-35, but Delaney nailed a long two-pointer and Staiger a three to get Bayern to 54-42. Staiger and Zubkov traded triples, before Maric scored inside to help Lokomotiv extend its lead to 62-45. Troutman scored from close range, and Staiger made his third from downtown, but Marcus Williams ended the quarter with a three-pointer of his own for a 65-50 margin. Staiger started the fourth quarter with his fourth three-pointer, and after Kalnietis and Bryant traded layups, Zipser’s basket-plus-foul made it 67-58. 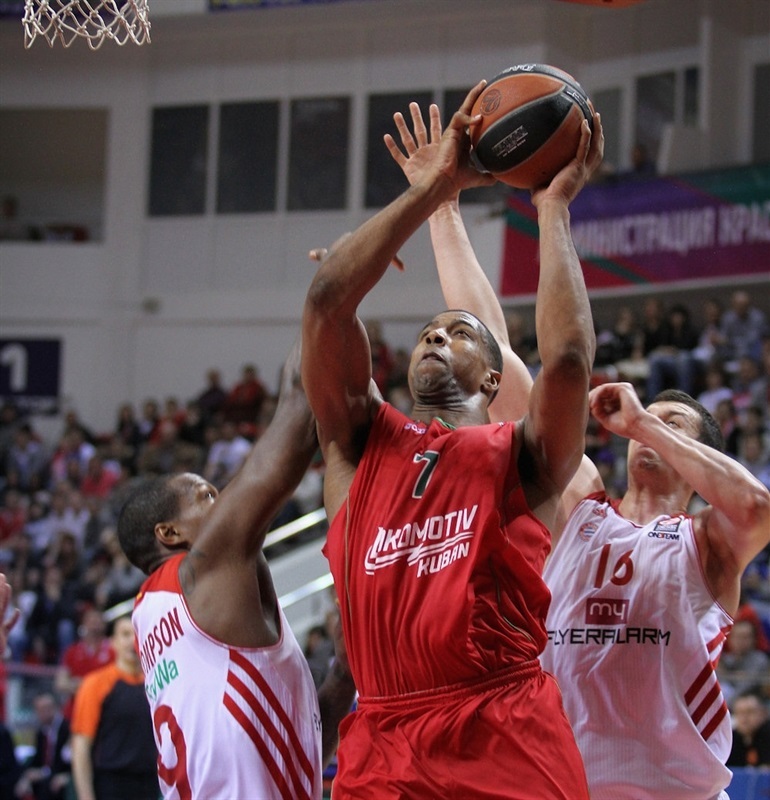 Simon nailed a three-pointer, but Troutman banked it in from close range for Bayern. 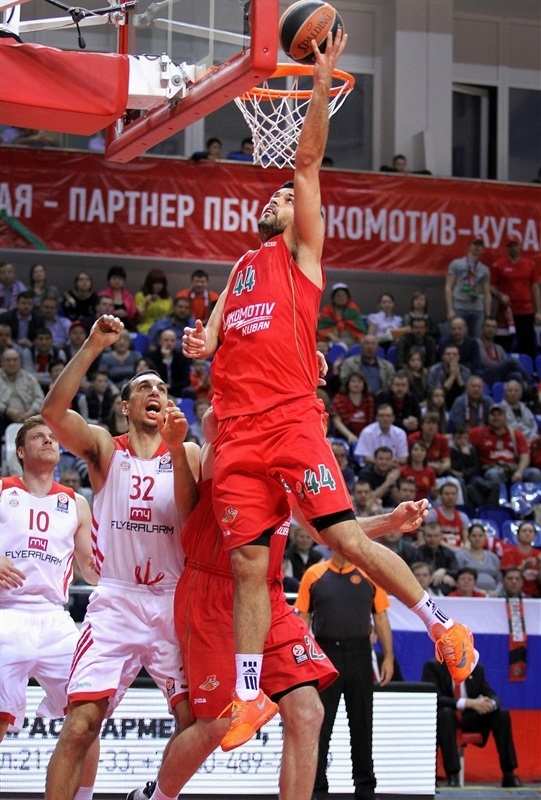 After Hendrix added a layup in the crowd to Lokomotiv’s tally, Djedovic hit a three-pointer to close within 72-63. The visitors continued to close in, as Deon Thompson hit a tough jumper, then Djedovic went on a run of his own, starting with a layup-plus-free throw, followed with a pair of long jumpers, both with a foot on the 6.75-meter line, to make it 74-72. Ponkrashov’s free throws gave the hosts some breathing room with two minutes remaining, and Brown added a pair for a 78-73 edge with a little under a minute to go. 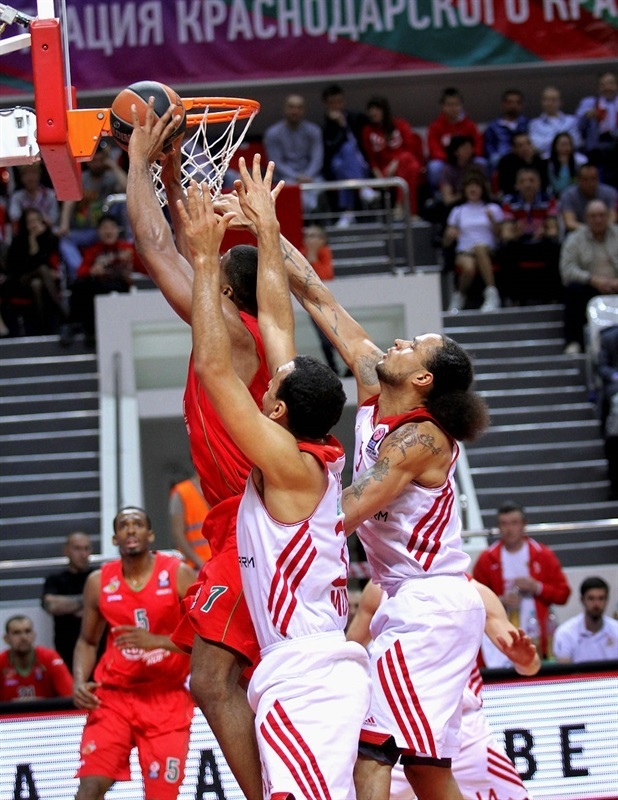 Idbihi scored a layup for Bayern, but Brown and Hendrix sealed it on the other end with more free throws. "I want to thank my players for what they did today. Unfortunately we weren't able to reach the desired point differential. But still it's a good win and we had a great season in Euroleague. We played good, maybe lacking something here and there, but you can see that our players are ready to fight till the end and will do their best in the VTB League and Russian Cup. " 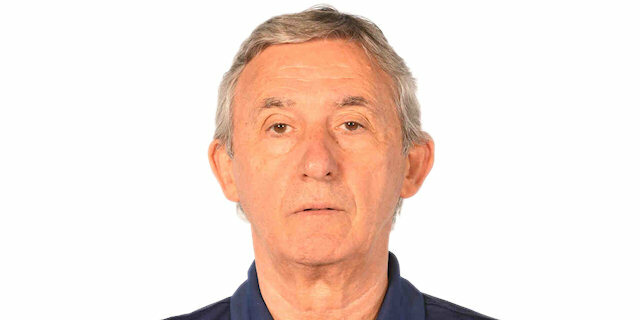 " I want to congratulate Lokomotiv for the victory. I think it was a very good basketball game from both teams. It was important for us to demonstrate what we can do in Euroleague for one last time this season. And we played well, especially in the second half when we were able to play good overall defense and especially against Brown and Simon. It's very important that we've seen the right attitude of all players on the court today. "